Since my last wine post, we have enjoyed quite a few bottles both at home and in restaurants. (What a surprise!) Starting with the wines we bought retail at one of the markets, as before the costs are between 4 and 8 Euros. The most inexpensive, at 3 Euros, from the OpenCor market right here in the Puerto Deportivo, is a Rioja from Casa Antono. It is a little young, a 2010 , but quite good. A Marques de Caceres 2009 Crianza was excellent. This bottle was only 7 Euros. I have seen it in the U.S. for $20+. One of the best bargains so far was a Campo Viejo 2009 Crianza for 5.50 Euros. Really very tasty. 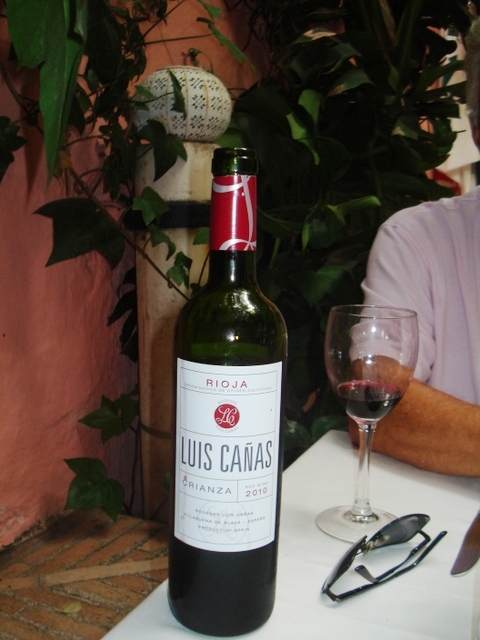 When enjoying tapas in Sevilla it was actually the house red at a couple of the Santa Cruz area taverns. The wines in the restaurants and Chiringuitos continue to surprise with their quality. There is a tapas bar around the corner from our apartment called the Taberna del Puerto. You sit outside where there is a big screen TV, something the local Spanish as well as English and Dutch expats really appreciate. One evening there, we watched a Champions League game between Barcelona and Ajax. Messi had the hat trick (three goals in one game). I don’t think they call it a hat trick in Spain, but the shouting and celebration required no translation. The routine is to walk inside and pick out your tapas, then have them served to you as they are ready. They leave the bottle on your table, and charge according to your consumption. It was a non-vintage Rioja bottled for themselves. Believe me it was great. We had four tapas and 1 1/3 bottles of wine. The cost 19 Euros. You can truly live cheaply here. We’ve had a few splurge dinners, one of which was a good Italian-style dinner at El Rincon Toscana in the old town of Estepona. A bottle of Baron de Ley 2008 was 28 Euros but an absolutely perfect pairing with our pastas. The last two days consisted of our side trips to Cordoba and Sevilla. We had a terrific lunch in Cordoba near the “Mezquita” but paired it with sangria. 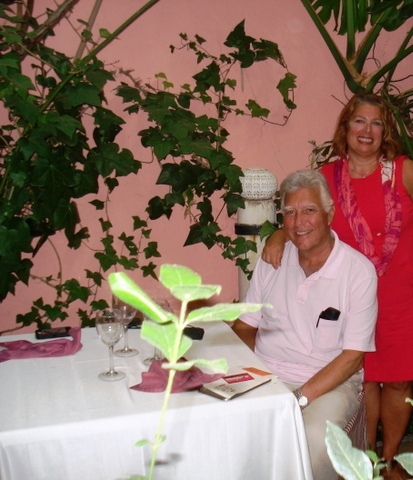 Our most expensive meal was in Sevilla before the bullfight at the “Corral del Agua”. Anita had the merluza while I had a magnificient rabbit stew washed down with a Luis Cana 2009 Rioja that was great at 18 Euros. We’ll be leaving Estepona for San Sebastian in a couple of days. We’ll miss this place. This entry was posted in Uncategorized on September 28, 2013 by ayoelkers.